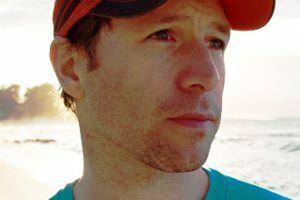 The two color blocks is a more casual look than some of the other jackets here lending the Eddie Bauer Cloud Cap Flex versatility that extends beyond day trips and weekends in the wild to dog walking and even soggy commutes. It’s a great rain jacket quiver killer, but best left to more recreational use. WeatherEdge is Eddie Bauer’s proprietary waterproof-breathable membrane. In the Eddie Bauer Cloud Cap Flex Rain Jacket they mixed the 2.5-layer version with a stretchier, softer fabric across the shoulders, hood and upper arms. Combined with a tough DWR coating we had nothing but beading in a day-long hike in the rain. On that soaker we also spent a lot of time under the hood. It doesn’t move with head twists, but being smaller (read: not helmet compatible) it didn’t block peripheral vision and required little fiddling from the three adjustment points to lock it down. The center zip is waterproof and backed by a strip of membrane to double down on leak prevention. The two hand pockets are covered. Breathability is moderate, but the Eddie Bauer Cloud Cap Flex Rain Jacket also has pit zips and mesh backed hand pockets. As we heated up we cracked both and the thermoregulation increased dramatically. 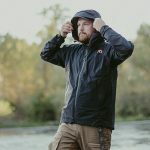 As one of the best fitting jackets in this test, the Eddie Bauer Cloud Cap Flex Rain Jacket always looked good and fit true to size on multiple body types. Having the stretch in the upper portion of the jacket is nice, maintaining coverage even when reaching overhead and never restricting dynamic moves. The hand pockets are perfectly placed for hand warming, but sit low. A pack waist strap or climbing harness over the jacket would make them useless. We’ve found the WeatherEdge membrane to be impressively durable over long-term use. 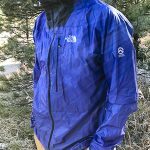 For a 2.5 layer it has lasted well in past testing and we expect it to do the same in the Eddie Bauer Cloud Cap Flex Rain Jacket. Adding the stretch helps reduce wear on seams. The Eddie Bauer Cloud Cap Flex Rain Jacket packs into one of the hand pockets, down to the size of a mini-football. At 12 ounces it’s not super light, but respectable for the category.